Launch Date November 2012: "Enhancing the visitor experience was a top priority for the SACVB this year and we are thrilled that the San Antonio hospitality community has embraced the nationally acclaimed Certified Tourism Ambassador program. We are proud that our partners have utilized the certification curriculum as a way to invest in their employees and to ensure that every visitor continues to receive the exceptional service that San Antonio is known for." Launch Date March 2013: "We have always relied on our front line personnel throughout Columbia to be great ambassadors for our destination. The implementation of the CTA program has allowed us to ensure that everyone is welcoming and sending the same messages to the thousands of visitors we have every week. We've had people go through our program ranging from hoteliers to real estate agents and police officers to bartenders, and the feedback from participants has been enthusiastic. Being a CTA city gives us an advantage because we know our visitors are welcomed to our community and given an experience that is above and beyond their expectations." 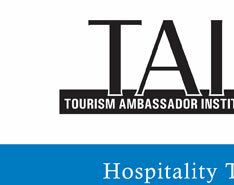 Administered through the Tourism Ambassador Institute®, the Certified Tourism Ambassador™ (CTA) Program is a certification program that serves to increase tourism by inspiring front-line hospitality employees and volunteers to work together to turn every visitor encounter into a positive, memorable experience. The premise is simple: If front-line employees and volunteers (those who come into immediate contact with the visitor) provide quality service to visitors (convention attendees, visitors, business travelers, etc. ), the visitor is more likely to have a positive experience. Visitors who have a positive experience are more likely to return at some point in the future. They will share their perceptions with their friends. Everyone benefits – the tourist, the hospitality industry, the local economy and, most importantly, the front-line ambassador. Upon completion of all program requirements, front line employees and volunteers are awarded the Certified Tourism Ambassador™ (CTA) designation and may use the initials CTA behind their names, i.e., John Smith, CTA. The designation is conferred by the Tourism Ambassador Institute® (TAI) in cooperation with a Convention & Visitors Bureau (CVB), Destination Marketing Organization (DMO), or other tourism entity. These organizations agree to uphold certain standards of practice as a TAI Accredited Provider in order to ensure a high level of program quality over time. Those achieving the CTA designation would be expected to participate in continuous learning activities in order to be re-certified on an annual basis. This certification component strengthens the program in the eyes of the front-line workers and their employers and, as such, has lasting value over time to a city, region, and the nation as the program grows from city to city. This exciting, ground-breaking program has many features that translate into a wide variety of benefits that permeate, and elevate, the entire hospitality and business community. One of the critically important differences between the Certified Tourism Ambassador Program offered by the Tourism Ambassador Institute® and these other training programs is that our program will lead to full certification as a Certified Tourism Ambassador™. Certification, unlike training, provides lasting value to the industry and the visitors and tourists it serves. Unites Front-Line Employees and Volunteers – Brings front-line ambassadors together to achieve a common, shared goal of enhancing the visitor experience. Increases Overall Convention & Tourism Business – An enhanced visitor experience leads to more frequent visits and better word-of-mouth about the region, which can lead to additional convention and tourism business. 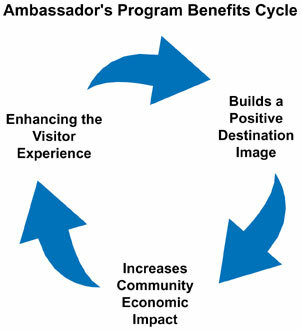 Increases the Economic Impact of Tourism – Not only will additional tourism result, but visitors are likely to spend more on each visit if they are directed by ambassadors to venues that match their interests (food, attractions, shopping, entertainment, etc.). Builds a Positive Brand and Overall Destination Image – If every experience is a good experience, the city will continue to shine in the eyes of the public making it easier to sell the city to decision makers, such as meeting planners, tour operators and boards of directors. In short, it strengthens brand awareness and top-of-mind perceptions about your area, while the ambassadors deliver your Brand Promise. Builds Upon Regional Collaboration – Gives your region a common, collaborative project that will help reinforce the importance of working together, instead of apart, to enhance regional tourism. Builds Public and Private Partnerships – Brings key corporations and hospitality organizations (museums, attractions, venues, etc.) together to support a program of critical importance to the future of tourism. It may also help local corporations recruit and retain top talent. Enhances the Current “Product,” While Building the Future – Telling visitors about the exciting things that are on the horizon will help drive future business and motivate the Ambassador corps. These shared learning experiences will help to ensure that visitors hear a consistent story about the attributes of your region. In short, the program has many features that translate into a wide variety of benefits that help strengthen the entire hospitality and business community. The Body of Knowledge has been developed through extensive research and field testing. Comprised of four modules, the Body of Knowledge covers the important elements of tourism, regional attributes/attractions and customer service. Learning objectives drive the learning experience and provide participants with a very clear idea about the most important learning outcomes in each Module. Sometimes, these objectives are written to: (a) describe facts the CTA candidates are expected to know; (b) describe principles or concepts that are important in the hospitality and tourism industries; and (c) describe an attitude or specific behavior (performance) that is expected of the Certified Tourism Ambassador. A variety of customization options are available to fit the needs and budgets of organizations of any size. Contact the TAI for more information. What’s in it for the front-line employee or volunteer? This program has been established with initial certification followed by re-certification annually thereafter. The annual certification renewal requirement ensures that CTAs are kept up-to-date on important new developments and that they participate in continuous learning in subjects comprising the CTA body of knowledge, especially regarding new developments in their city/region. Attending relevant conferences, workshops, seminars, etc. Recertification also ensures that the program maintains momentum and evolves over time to meet the needs of CTAs and visitors. 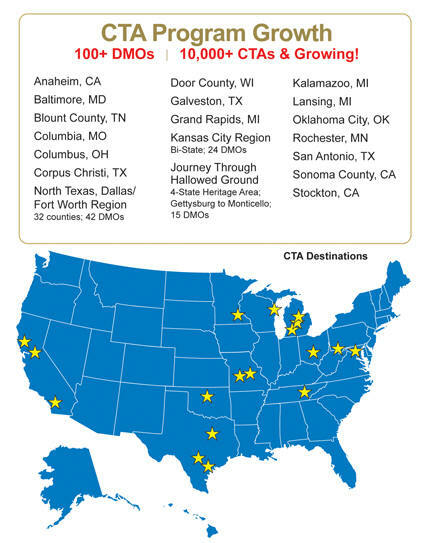 CTA “Rewards”, such as discounts at participating restaurants, attractions, etc. · Enhancing their product knowledge – the city’s restaurant, attractions, and everything else a visitor may want to do or inquire about. · Taking advantage of discounts or free offerings from participating supporters to experience their “product” and in order to be able to recommend it first-hand to visitors.